Emmy Noether enrolled as a student at FAU in 1904. She was the first woman to be enrolled as a full-time student at the University, studied mathematics and completed her doctoral degree in 1907. 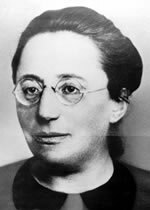 Emmy Noether is regarded as one of the founders of modern algebra. Noetherian rings and modules, and the Noether normalisation lemma are named after her, as is the Noether theorem in physics. Emmy Noether’s life reflects the tragic fate of a talented woman from a Jewish family who lived in Germany at the beginning of the twentieth century. First she was met by resistance in society and academia, as women were not allowed to study in Germany until the early twentieth century. Women were still banned from completing a habilitation until 1919, and it was not until then that Emmy Noether was able to complete hers and teach under her own name. In 1933, under the National Socialist regime, she had her teaching rights removed and emigrated to the USA. FAU honours its most famous alumna as the namesake of the Emmy Noether lectures and the Emmy Noether Prize which is awarded by the Faculty of Sciences. A detailed portrait of the life of this outstanding mathematician can be found in the university lecture by Prof. Knut Radbruch entitled ‘Emmy Noether: Mathematikerin mit hellem Blick in dunkler Zeit’ (Emmy Noether: A mathematician with a positive outlook in dark times).